The expansion of the North Dakota Heritage Center was a major investment in the preservation of the state’s history. From state-of-the-art storage areas to new State Museum galleries, we were given the tools needed to protect and present North Dakota’s story for decades to come. I’d like to share with you one way we’re using the expansion to safeguard those stories. The Native American collection was most recently housed in three rows of wooden drawers, all similar to what you see here. North Dakota’s native people have always played an important role in the state's history, and the State Museum’s collection reflects that. Some of the earliest pieces we collected back in the early twentieth century were Native American in origin, and it is something that we have continued to build upon ever since. 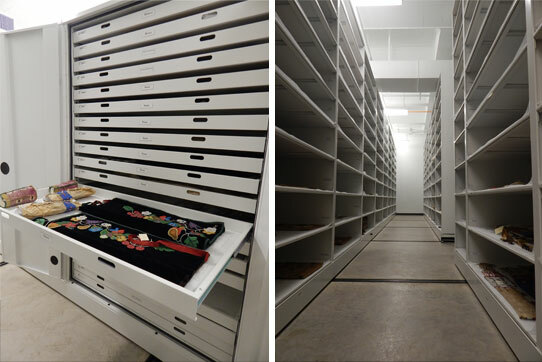 During our recent expansion project, it was decided that the Native American collection would be the primary focus of our new, 5,000-square-foot collection storage area. The new space is a big improvement for the collection, because it went from occupying three rows of storage to 21, plus a restricted access room specifically created to house more significant or sensitive items. With more room and improved shelving, we can better care for and continue to expand on an already exemplary collection. 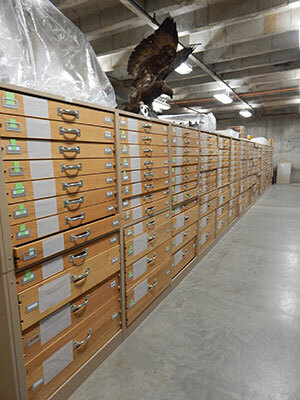 A panorama of our new collection storage room, which is initially committed to the Native American collection. In this image you can see that much of our new area contains compact, moveable shelving. Rows are accessed by rotating the black handles you see on the side of each unit, which causes the shelves to move along the tracks in the floor. That allows us to fit more rows of storage in the room than if they were stationary. In October 2013, I started planning a basic layout for the new area and figuring out the scope of the project. After a few weeks of preparation, I began the move of the Native American collection to the new space. With nearly 4,000 artifacts involved, it was a challenging project to organize and wrap my head around. That is especially true given all the different types of artifacts such as beaded moccasins, hide dresses, firearms, preserved food, and even a birch bark canoe, just to name a few, each of which have unique needs and preservation concerns. The original shelving units for the collection were filled many years ago and space was limited. This was our chance to store the collection exactly how we wanted it, and much thought was put into what we would do. We decided to arrange the new storage area into sections divided by type of artifact and also separated out by tribe within each section. That allows us to easily compare the differences between say, Sioux and Chippewa pipe bags. With similar objects grouped together, the layout also makes artifacts easier to find. Left: Here you can see one of our enclosed cabinets, which are ideal for objects such as clothing. Notice the gaskets around the doorframe. With these seals in place, the environmental conditions inside each cabinet are very stable. Also notice the labels on each shelf with tribe names. I organized the storage area by type of object, separated by tribe. That arrangement allows us to easily compare objects created by different tribes. Right: A row of open shelving, which happens to contain various types of bags, pouches, and other containers. I have spent the last 18 months moving the collection over to the new area, cartload by cartload. As of this writing, I have about 22 artifacts left to move. There is more work to be done in the space, but phase one is nearly complete!